Alisa Abbott represents clients in all facets of design patent procurement, prosecution, enforcement and infringement. Her practice includes evaluating and securing design patent protection of a broad range of sophisticated technologies, as well as general intellectual property counseling including obtaining trademark and copyright protection. Ms. Abbott has extensive experience advising on claims regarding apparel, footwear, athletic accessories and equipment, portable and wearable electronic devices, home entertainment devices and systems, home appliances, construction materials, medical equipment, packaging, and static, animated and transitional graphical user interfaces and icons. Ms. Abbott assists clients at each level of design patent prosecution, ensuring thorough and efficient claim protection. Ms. Abbott’s practice also includes post-allowance support, such as client advocacy and dispute resolution when infringement or enforcement needs may arise. Ms. Abbott draws on several years of intellectual property and design patent experience. 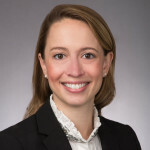 Prior to joining Banner & Witcoff, she practiced at a boutique intellectual property firm advising one of the world’s largest electronics manufacturers on both foreign and domestic design procurement and prosecution. Ms. Abbott has written articles addressing issues related to design patent rights, including co-authoring an article entitled, “Clarifying Multi-Embodiment And Single-View Design Filings” in Law360, and a chapter entitled, “Protecting and Enforcing Design Rights in the United States,” for World Trademark Review‘s Designs: A Global Guide in 2018 and 2019. Ms. Abbott graduated from the University of Virginia with a Bachelor of Arts degree, double-majoring in American Studies and Religious Studies. During her undergraduate career, she was an executive board member of the largest student-service organization on grounds. She earned her J.D. from Washington & Lee University, focusing the majority of her practicum-based studies on intellectual property coursework. Throughout law school, Ms. Abbott was actively involved in community service. As a third-year law student, she served as president of the Women’s Law Student Organization, as well as a court appointed special advocate. Upon graduation, Ms. Abbott received recognition for exceptional law-related service. 06.07.2017 | Banner & Witcoff Welcomes Four New Attorneys to Chicago and Washington, D.C.